This student submission comes from my former student Kerryana Medlin. Her topic: working with the half-life of a radioactive element. How can this topic be used in you students’ future courses in mathematics or science? Depending on when they take precalculus, this topic may appear earlier or later in chemistry. The following is the list of TEKS for this topic in chemistry. (C) compare fission and fusion reactions. This is likely the most immediate application the students will encounter, but this topic also appears in calculus and, later, in the topic of differential equations, since it involves exponential decay. This topic can also be brought up in environmental science to mention the lifetime of radioactive isotopes. When a student crunches the numbers on the lifetimes of these isotopes, they can see that sometimes a small action has a huge ripple effect, especially for isotopes that humans bring into the picture. What interesting things can you say about the people who contributed to the discovery and/ or the development of this topic? Ernest Rutherford received a Nobel Prize in Chemistry in 1908 for his discovery of the half-life of radioactive materials and his insistence that we apply this information to find the Earth’s age (Mastin, 2009). This later became more of a reality when Willard Libby started to develop carbon dating in 1946 (Radiocarbon Dating). Since then, carbon dating has been used to find the age of historical artifacts and bones, allowing historians to find more accurate time frames of events. Carbon is not the only radioactive isotope. There are others which come to mind more readily when the word “radioactive” is used. These are typically the elements used for nuclear reactors. These are elements which readily undergo nuclear fission, which is the splitting of atoms, which releases energy. Uranium and Plutonium are the most common of these isotopes. Uranium-235 is the most commonly used for reactors and bombs (Brain and Lamb, 2000). This is probably the more interesting part of half-lives of elements and can extend the learning to an environmental issue such as nuclear waste, which takes an extremely long time to decay and which the U.S. Government has, in the past, not handled so well. (But I am not going into that, lest I go on a rant). The last piece of history worth mentioning is fairly recent (and can be seen in real life and in the game mentioned later in this paper) which is that half-lives are not so clear cut. There is definitely a lot of estimating involved in the accepted half-life values. There is an article about this if you are interested (http://iopscience.iop.org/article/10.1088/0026-1394/52/3/S51/pdf), but I will leave it at this: much like most mathematical models, there is error in the half-life model, and the model formed may be a best fit, but there are always outliers for data and while carbon dating and half-lives of Uranium can give great estimates of what we are working with, they are not perfect. For this topic, there is an interactive simulation posted on PHET. It lends itself to a guided worksheet which would allow students to use the simulations to create the functions for each half-life. Once there, download and run the game. At the top of the game window are four different tabs: Half Life, Decay Rates, Measurement, and Dating Game. We will be going through each one in that order. Some information about radioactive isotopes: An isotope is an element which has the same number of protons in its nucleus, but a differing number of neutrons, thus making it radioactive. These elements have lives which are defined by the time it takes to no longer be radioactive. What do you observe about the lives of the isotopes? What time-frame do these lives fall into? Do the same for Uranium-238 and record the time-frame. This part works by adjusting the slider and allowing the isotopes to run the course of their lives. What does the graph on the bottom tell us? How does one read the half-life of an isotope from this graph? At what percent do we find the first half-life? What is the half-life of Carbon-14 from this graph? Half-life of Uranium-238? On this one, you activate two separate events and then take readings of the amount of Carbon-14 and Uranium-238 in the objects. Which item contains the Carbon-14? The Uranium-238? Use the pause feature as you are taking the readings to find precise values of the half-lives. At what percentages should we be reading the half-lives? Use this data to create a function to model the half-life of both isotopes. Use your functions to estimate the date of two of the items (One C-14 and one U-238) in the dating game. Write down the name of the item and the estimated age of the item. Mastin, Luke. (2009). Important Scientists: Ernest Rutherford (1871-1937). The Physics of the Universe. This student submission comes from my former student Jillian Greene. Her topic, from Precalculus: introducing the number e.
The first time it’s compounded, the final value will be $2. However, the more compounding periods you add, the closer to e you’ll get. For instance, weekly would be A=1(1+1/52)^52=2.69259695. Every second will get you A=1(1+1/31536000)^31536000=2.71828162, which is pretty to 2.718. The last three calculations will actually begin with 2.718. We can have some discussion with this as a class, bringing in the concept of limits. Then we can assess and see if anyone has seen this number before. If not, they can pop out their calculators and you can have them type “e” and then hit enter, and blow their minds. hence God exists; reply!” In response to the French philosophe Diderot, who was trying to convert the court of Catherine the Great of Russia to atheism. Diderot had no idea what Euler was talking about and left the court to a chorus of laughter.” Back to e, however. If Euler did not first discover it, who did? A man name John Napier did the best he could to discover e. Napier was alive from 1550-1617, so he did not have access to a rich history of advanced algebra. Logarithm tables existed, some close to natural log, but none to identify this mystical number. Napier was merely trying to find an easier way to approach multiplication (and consequently exponentiation). His work, Construction of the Marvelous Rule of Logarithms, he states that X=Nap log y, where Nap log (107)=0. In today’s terms, with today’s math, we can translate that to Nap log y = 107 log1/e(y/107). How has this topic appeared in high culture (art, classical music, theatre, poetry* etc.)? After some discussion on this topic, if my class is a pre-AP or particularly curious class, I will have them go around and read this poem about e out loud. Then from this poem, I can have the students split up into groups. Each group will be responsible for dissecting this poem for certain things and then presenting their most interesting/exciting/relatable findings. One group will tackle the names; what history lesson is given to us here? Another group will handle applications; what did the various figures say we can do with e? The final group will report back on different representations of e; what all is e equal to? My expectations here would be for the students to see the insanely vast history and application of this number and gain some appreciation. I would expect to see Napier, Euler, and Leibniz for sure from the first group. From the second group, I would expect continuous compound interest, 1/e in probability and statistics, and calculus. The third group would be expected to present the numerical value of e, the limit that e is equal to, its infinite sum representation, and Euler’s identity. A number worthy of a 500 word poem and a slew of historical mathematicians must be important. He felt its power, but never realized its nature. A hundred thirteen years the hit and run goes on. e rushed to make a claim—the next in line. e in its infancy as 2.718281828459045235.
digit by digit, to 200,000,000,000 decimal places. It found a new digital game to play. Bernoulli‘s compounded interest for an investment of one. and when they leave, e‘s reciprocal hands each a stranger’s hat. was proved to be a transcendental number. e flirts with complex numbers and roots of unity. whose derivative is equal to itself. and often e makes guest appearances in Taylor series expansions. honors and administrative duties multiply with age. This student submission comes from my former student Brianna Horwedel. Her topic: working with the half-life of a radioactive element. Half-Life of radioactive elements in Pre-calculus is generally used when introducing exponential decay. However, its main application is in the field of Chemistry and Archeology. If students go on to take any type of chemistry, they will definitely learn more about the half-life of radioactive elements and how long it takes to get rid of certain nuclear elements. The half-life of Carbon-14 is especially important in Archeology. Carbon-14 dating is a method used to determine the age of archeological artifacts of a biological origin using the half-life of Carbon-14. This process can date bone, wood, cloth, plant fibers, and more that are up to 50,000 years old. The way it works is as follows: as soon as a living organism dies, it stops taking in new carbon. The ratio of carbon-12 to carbon-14 is the same as every living thing. However, when an organism dies, the carbon-14 starts decaying with its half-life of 5,700 years. The carbon-12 does not decay. When an organism is found, they look at the ratio of carbon-12 to carbon-14 to determine the age based on the half-life of carbon-14. I think this topic lends itself nicely to a project. Firstly, I would come up with several half-lives and place them in a bowl. Each student would pick a half-life and have to make up an element. Using poster-board, they would give a brief description of what their element is and then create a graph illustrating their particular half-life. They would then present it to the class explaining how they graphed their line and what equation they used. They could also include a table of input and output values. This would be a great refresher on graphing exponential decays along with allowing a little creativity. I think the students would have a lot of fun with this type of project. I found this really great web-site (https://jeopardylabs.com/play/exponential-growth-decay) that has an exponential growth and decay form of Jeopardy. It allows you to pick how many teams there are and then it sets up a Jeopardy board. This would be a really fun way to review at the end of a unit over exponential growth and decay. To make the students more engaged, I would offer extra credit to the team with the highest score at the end. Because it is in a game form, students are more likely to pay attention to this type of review. This student submission comes from my former student Loc Nguyen. His topic, from Precalculus: introducing the number . 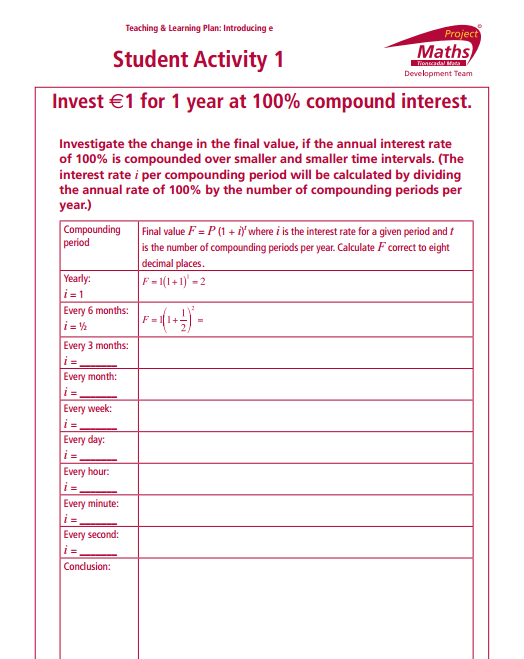 To be able to understand where the number e is produced in the first place, students need to understand how compound interest is calculated. Before introducing the number e, I will definitely create an activity for the students to work on so that they can eventually find the formula for compounding interest based on the patterns they produce throughout the process. The compound interest formula is F=P(1+r/n)nt. From this formula, I will again provide students a worksheet to work on. In this worksheet, I will let P=1, r=100%, t=1, then the compound interest formula will be F=(1+1/n)n. Now students will compute the final value from yearly to secondly. To introduce to the students what the number e is, I will engage them with two videos. In the first video, https://www.youtube.com/watch?v=UFgod5tmLYY, the math song “e a magic number” will engage the students why it is a magic number. While watching this clip, the students will be able to learn the history of e. Also the students will see many mathematical formulas and expressions that contain e. This will give them a heads up that they will see these in future when they take higher level math. It is also pretty humorous of how Dr. Chris Tisdell sang the song. In the second video, https://www.youtube.com/watch?v=b-MZumdfbt8, it explained why e is everywhere. The video used probability and exponential function to illustrate the usefulness of e, and showed how e is involving in everything. It gave many examples of e such as population, finance… Also the video illustrates the characteristics of the number e and the function that has e in it. Watching these videos will enhance students’ perception and understanding on the number e, and help them to see how important this number is. This student submission comes from my former student Nada Al-Ghussain. Her topic, from Precalculus: introducing the number e.
Not every student loves math, but almost all students use math in his or her advanced courses. Students in microbiology will use the number e, to calculate the number of bacteria that will grow on a plate during a specific time. Biology or pharmacology students hoping to go into the health field will be able to find the time it takes a drug to lose one-half of its pharmacologic activity. By knowing this they will be able to know when a drug expires. Students going into business and finance will take math classes that rely greatly on the number e. It will help them understand and be able to calculate continuous compound interest when needed. Students who do love the math will get to explore the relation of logarithms and exponentials and how they interrelate. As students move into calculus, they are introduced to derivatives and integrals. The number e is unique, since when the area of a region bounded by a hyperbola y= 1/x, the x-axis, and the vertical lines x=1 and x= e is 1. So a quick introduction to e in any level of studies, reminds the students that it is there to simplify our life! In the late 16th century, a Scottish mathematician named John Napier was a great mind that introduced to the world decimal point and Napier’s bones, which simplified calculating large numbers. Napier by the early 17th century was finishing 20 years of developing logarithm theory and tables with base 1/e and constant 10^7. In doing this, multiplication computational time was cut tremendously in astronomy and navigation. Other mathematicians built on this to make lives easier (at least mathematically speaking!) and help develop the logarithmic system we use today. Henry Briggs, an English mathematician saw the benefit of using base 10 instead of Napier’s base 1/e. Together Briggs and Napier revised the system to base 10, were Briggs published 30,000 natural numbers to 14 places [those from 1 to 20,000 and from 90,000 to 100,000]! Napier’s became known as the “natural logarithm” and Briggs as the “common logarithm”. This convinced Johann Kepler of the advantages of logarithms, which led him to discovery of the laws of planetary motions. Kepler’s reputation was instrumental in spreading the use of logarithms throughout Europe. Then no other than Isaac Newton used Kepler’s laws in discovering the law of gravity. In the 18th century Swiss mathematician, Leonhard Euler, figured he would have less distraction after becoming blind. Euler’s interest in e stemmed from the need to calculate compounded interest on a sum of money. The limit for compounding interest is expressed by the constant e. So if you invest $1 at a rate of interest of 100% a year and in interest is compounded continually, then you will have $2.71828… at the end of the year. Euler helped show us many ways e can be used and in return published the constant e. It didn’t stop there but other mathematical symbols we use today like i, f(x), Σ, and the generalized acceptance of π are thanks to Euler. Statistics and math used in the same sentence will make most students back hairs stand up! I would engage the students and ask them if they started a new job for one month only, would they rather get 1 million dollars or 1 penny doubled every day for a month? I would give the students a few minutes to contemplate the question, without using any calculators. Then I would take a toll of the number of the students’ choices for each one. I would show them a video regarding the question and idea of compound interest. Students will see how quickly a penny gets transformed into millions of dollars in a short time. Money and short time used in the same sentence will make students fully alert! I would then ask them another question, how many times do you need to fold a newspaper to get to the moon? As a class we would decide that the thickness is 0.001cm and the distance from the Earth to the moon would be given. I would give them some time to formulate a number and then take votes around the class, which should be correct. The video is then played which shows how high folding paper can go! This one helps them see the growth and compare it to the world around them. After the engaged, students are introduced to the number e and its roll in mathematics. This student submission comes from my former student Kenna Kilbride. Her topic, from Precalculus: introducing the number e.
The number e can be seen in many different areas of mathematics and with many different series and equations. Stirling’s approximation, Pippenger product, and Euler formula are just a few more examples of where you can see the number e.
Introducing this constant can be a very hard thing for a teacher to do and using a word problem that involves a satellite that students can comprehend what they do in the sky will help. where t is the time in days and e is the base of natural logarithms. John Napier was born in Scotland around 1550. Napier started attending St. Andrews University at the age of 13. After leaving St. Andrews without a degree he attended Cambridge University. Later he studied abroad, presumably in Paris. In 1614 Napier invented logarithms and later exponential expressions. Along with mathematics, Napier was interested in peace keeping and religion. Napier died on April 4, 1617 of gout. Euler contributed to e, a mathematical constant. He was born 1707 in the town Basel of Switzerland. By the age of 16 he had earned a Master’s degree and in 1727 he applied for a position as a Physics professor at the University of Basel and was turned down. Due to extreme health problems by 1771 he had lost almost all of his vision. By the time of his death in 1783, the Academy of Sciences in Petersburg had received 500 of his works. The negative sign on the right-hand side isn’t strictly necessary, but it’s a reminder that amount present decreases as time increases. Of course, students in Algebra II or Precalculus (or high school chemistry) are usually not ready to understand this derivation using calculus. Instead, they are typically given the final formula and are expected to use this formula to solve problems. Still, I think it’s important for the teacher of Algebra II or Precalculus to be aware of how the origins of this formula, as it only requires mathematics that’s only a year or two away in these students’ mathematical development. This student submission comes from my former student Jesse Faltys. Her topic: solving exponential equations. APPLICATIONS: What interesting (i.e., uncontrived) word problems using this topic can your students do now? 1. How long will it take for $1000 to grow to $1500 if it earns 8% annual interest, compounded monthly? We do not know . We will solve this equation for and will round up to the nearest month. In five years and one month, the investment will grow to about $1500. 2. A school district estimates that its student population will grow about 5% per year for the next 15 years. How long will it take the student population to grow from the current 8000 students to 12,000? We will solve for t in the equation . The population is expected to reach 12,000 in about 8 years. 3. At 2:00 a culture contained 3000 bacteria. They are growing at the rate of 150% per hour. When will there be 5400 bacteria in the culture? A growth rate of 150% per hour means that and that is measured in hours. At about 2:24 ( minutes) there will be 5400 bacteria. A note from me: this last example is used in doctor’s offices all over the country. If a patient complains of a sore throat, a swab is applied to the back of the throat to extract a few bacteria. Bacteria are of course very small and cannot be seen. The bacteria are then swabbed to a petri dish and then placed into an incubator, where the bacteria grow overnight. The next morning, there are so many bacteria on the petri dish that they can be plainly seen. Furthermore, the shapes and clusters that are formed are used to determine what type of bacteria are present. CURRICULUM — How does this topic extend what your students should have learned in previous courses? The students need to have a good understanding of the properties of exponents and logarithms to be able to solve exponential equations. By using properties of exponents, they should know that if both sides of the equations are powers of the same base then one could solve for x. As we all know, not all exponential equations can be expressed in terms of a common base. For these equations, properties of logarithms are used to derive a solution. The students should have a good understanding of the relationship between logarithms and exponents. Logs are the inverses of exponentials. 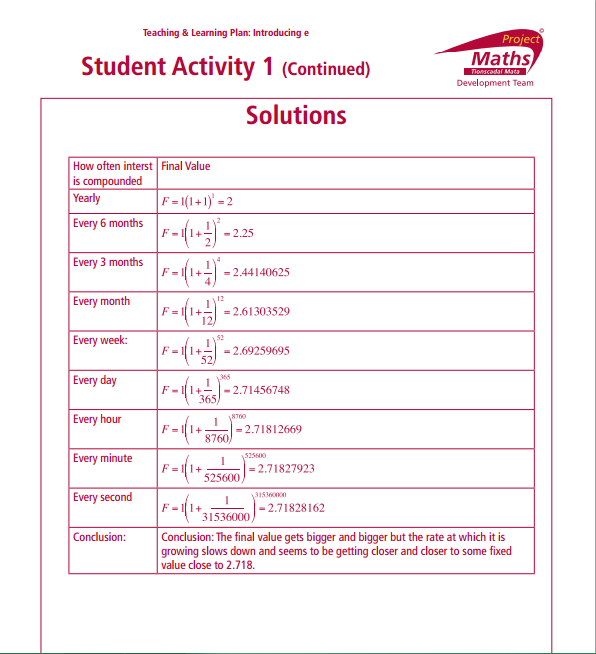 This understanding will allow the student to be able to solve real applications by converting back and forth between the exponent and log form. That is why it is extremely important that a great review lesson is provided before jumping into solving exponential equations. The students will be in trouble if they have not successfully completed a lesson on these properties. Technology – How can technology be used to effectively engage students with this topic? 1. Khan Academy provides a video titled “Word Problem Solving – Exponential Growth and Decay” which shows an example of a radioactive substance decay rate. The instructor on the video goes through how to organize the information from the world problem, evaluate in a table, and then solve an exponential equation. For our listening learners, this reiterates to the student the steps in how to solve exponential equations. 2. Math warehouse is an amazing website that allows the students to interact by providing probing questions to make sure they are on the right train of thought. For example, the question is and the student must solve for . The first “hint” the website provides is “look at the bases. Rewrite them as a common base” and then the website shows them the work. The student will continue hitting the “next” button until all steps are complete. This is allowing the visual learners to see how to write out each step to successfully complete the problem.